A 4,633 sq. ft. "McMansion" completed just before new size restrictions went into effect in LA. Built on a 7,411 sq. ft. lot, this home would be illegal under new rules. Los Angeles residents are reeling because of new ordinances restricting home sizes in 20 single-family neighborhoods. Many are concerned that the restrictions, lasting up to two years, could have a destabilizing effect on the already volatile Los Angeles real estate market. On March 25, the LA City Council enacted two Interim Control Ordinances (ICOs) in direct response to complaints about the “mansionization” trend of building large homes (also known as McMansions) which outsize neighboring homes. The goal of the ordinances, which will last anywhere from 45 days to two years, is to temporarily and immediately halt the “significant change” caused by mansionization. The first ordinance prohibits the demolition and substantial alteration of homes in five Historic Preservation Overlay Zones (HPOZs). 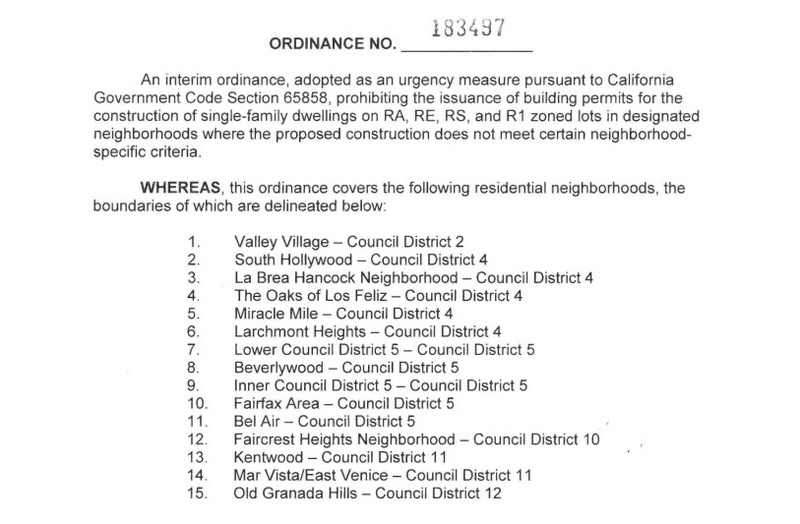 The second ordinance limits the scale of new construction in 15 additional neighborhoods. The Council plans to work on permanent regulations while the interim ordinances are in place. News of the pending ordinances had developers rushing to build as many large homes as possible. Throughout Los Angeles, there are now hundreds of homes that are considered “illegal McMansions” pursuant to the recently enacted ordinances. Mansionization refers to the practice of demolishing older homes and replacing them with the largest home possible, given the lot size. In some Los Angeles areas, it’s not uncommon to see nearly 4,000 square foot homes on 6,000 square foot lots. With a recent spike in real estate prices, mansionization has become a hot topic. Neighbors complain that “McMansions” tower over their homes, simply don’t match and compromise the character and aesthetics of the neighborhood. Others argue that the mansions compromise their privacy because they are built too close to existing properties. The Baseline Mansionization Ordinance (BMO) was originally enacted in 2008 to limit the size of new and renovated homes, based on lot size. Since then, however, the ordinance has been harshly criticized for “loopholes” allowing homeowners and developers to circumvent the restrictions, erect massive homes and deprive neighboring homeowners of privacy and sunlight. For example, under the original ordinance, complying with “environmentally friendly guidelines” or specific setback requirements allowed for a 20 percent square footage bonus. Once a few developers caught on, larger homes once again became the norm. Fast forward almost seven years later and Councilman Paul Koretz has implemented a temporary solution. 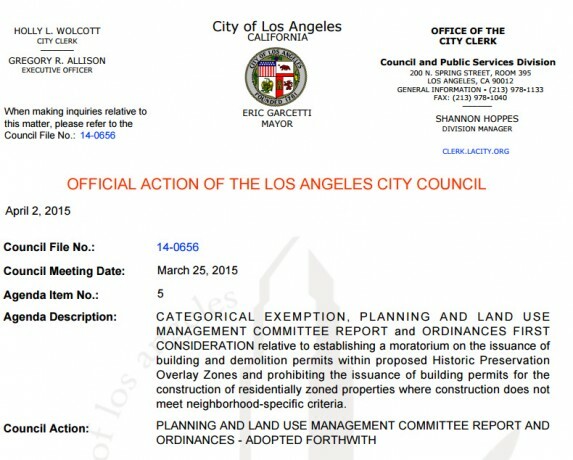 The new restrictions aim to close the loopholes and once and for all put an end to the mansionization of Los Angeles. Five of the 20 neighborhoods affected by these regulations, pursuant to Final Ordinance No. 183496, are Sunset Square, CarthaySquare, Holmby-Westwood, Oxford Square and the Berkshire Craftsman district of El Sereno. These specific neighborhoods were targeted for historical preservation. Demolition of all single-family homes are banned in these HPOZs. The other 15 affected neighborhoods, pursuant to Final Ordinance No. 183497, which have had a higher than usual level of new construction activity, are Valley Village, South Hollywood, La Brea Hancock Neighborhood, The Oaks of Los Feliz, Miracle Mile, Larchmont Heights, Lower Council District 5 (Westwood), Beverlywood, Inner Council District 5, Fairfax, Bel Air, Faircrest Heights, Kentwood, Mar Vista/Venice and Old Granada Hills. The restrictions applying to homes in these areas vary widely. Homes in Westwood, Kentwood and Mar Vista/East Venice will no longer be eligible for 20% bonuses for environmentally friendly “green” features, proportional stories or front facade articulations. Projects that received a certificate of compliance via the U.S. Green Building Council’s Leadership in Energy and Environmental Design (LEED) program were granted the 20 percent bonus. LEED houses are said to be environmentally friendly and save money while promoting renewable and clean energy. Front facade articulation and proportional stories bonuses were intended to prevent the building of box shaped houses without setbacks that weren’t aesthetically pleasing. Second and subsequent stories had to be no larger than two thirds of the first story. Prior to the ICO, you could build a 4,600 sq. ft. house on a 7,400 sq. ft. lot (800 sq. ft. of which was the 20% additional bonus). Under the new restrictions, you would only be able to build a 3,700 sq. ft. house, which is almost 1,000 sq. ft. smaller. 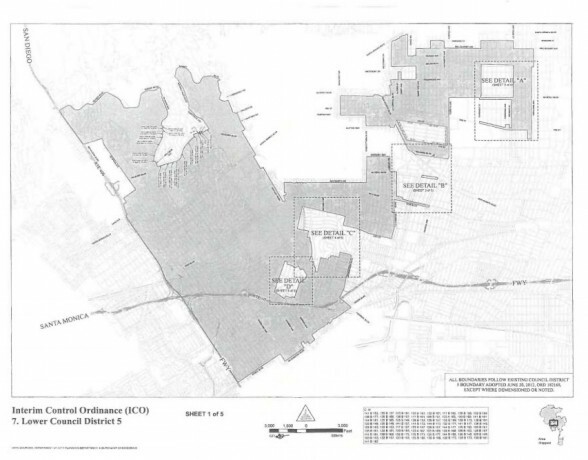 A map showing the areas subject to the ordinance in Los Angeles’ Lower Council District 5. Houses built in the Beverlywood and Fairfax areas will still receive bonuses for green features but will be limited to 15% square footage bonuses. Prior to the ICO, builders were entitled to a 20% of bonus space under green and architectural exceptions. 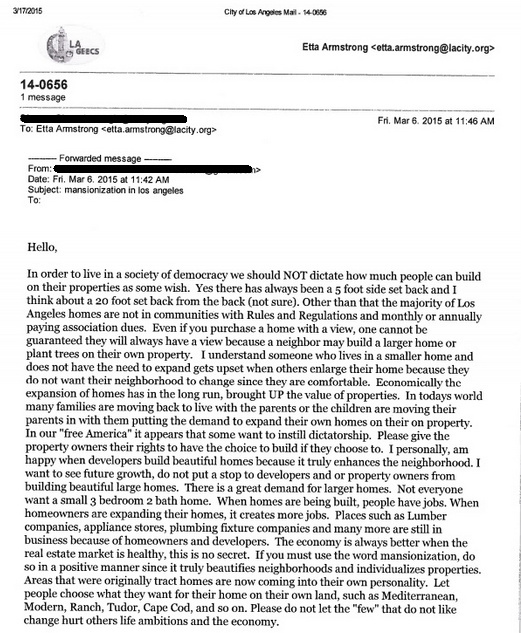 Some who oppose mansionization in Beverlywood argue that the 15% limitation is not enough. Bel Air restrictions govern how much dirt can be imported and exported (6,000 cubic yards, total) when rebuilding on hillside areas since homeowners there complained about pollution and safety issues caused by trucks making multiple trips up and down residential streets. This restriction may come as a major disappointment for those planning to build homes in an area which is known, worldwide, for its very large homes. In these areas, newly constructed homes cannot exceed 20 percent of the size of the demolished home. For example, if a 2,000 sq. ft. home is demolished, it could not be replaced with a home exceeding 2,400 sq. ft.
Basements will be included allotted square footage in the Oaks neighborhood of Los Feliz. Many feel victimized by the ordinance since thousands of homeowners are now subject to restrictions caused by the actions of a handful of aggressive real estate developers. They contend that they should be allowed to build larger homes to accommodate their growing families. Others feel that the imposition of these restrictions will create disparity by devaluing smaller homes and increasing the value of larger homes. Some find it ironic that many residents so vehemently supported enactment of the ordinances since they effectively lowered the value of their own homes. The reality is, critics claim, that not all of the new homes being built are “boxy,” real estate values have been rising and imposition of restrictions could have a devastating impact on home values. Many contemplating purchasing homes in the areas impacted by the ICOs may reevaluate given the negative consequences they may have on the real estate market. Will potential homeowners invest in an areas precluding the option to expand and build a larger homes? Especially if all of the smaller homes in the area were originally built decades ago. For example, most of the smaller homes in the Westwood area of Los Angeles were built over half a century ago. Those who have recently purchased in affected areas, with the intention of rebuilding a larger new home in place of a smaller old home, will now have to deal with the restrictions imposed by the new ordinances. With two different schools of thought surrounding the mansionization trend, it will be interesting to see who emerges victorious when the interim ordinances end and the permanent ordinances are put into place. Time will tell what impact the ordinance will have on pricing and inventory in parts of Los Angeles which are and are not subject to the ordinances. Will prices of small homes drop in areas like Westwood? Will prices increase in areas which are not subject to the ordinances? With so many variables, like potentially rising interest rates, in play, these are difficult questions to answer. In an already overcrowded city that is approaching its maximum population capacity and grappling with an artificially created housing crisis, it will surely be an interesting road ahead.